If my birthday surprise wasn't already enough, my wonderful flatmate, Eunseong, also gave me the sweetest little gifts from a shop we both love - Designtorget. We discovered this shop by accident, one sunny day, while we were wandering around the harbour here in Oslo. Scandinavia is quite well known for their quirky designs and Designtorget is no exception. I love these lovely iceberg icecubes and this fun tea strainer, for example. They're kind of impractical but very pretty and smart. But most of all, I love the two sweet gifts that dear Eunseong gave to me. First of all, she gave me this sweet birdhouse for my keys. 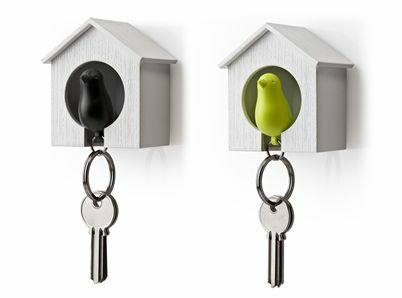 You attach the little bird keyring to your keys and stick the little birdhouse to the wall by the door. When you get home you can put the little bird in his house, to keep your keys safe. His tale is also a whistle, which is kind of random but kind of exciting too! It actually turned out to be the perfect gift because I am constantly late in the mornings because I can never find my keys! What do you think? Do you like the look of this store? I love funny little shops like this one, there are so many nice gifts to be found there. If I win the lottery you can be sure that I won't have any normal cutlery or appliances, everything I own will be novelty designs like these ones! I love when the design of everyday items has a unique and thoughtful twist. Those key chains are adorable! What thoughtful gifts! I absolutely love the birdhouse. I definitely need one of those. What a great shop! I was checking out the links you posted. Lovely gifts you got! Score!!! I love the birdhouse key holder. Adorable. Also, I love your flatmate's name. Does it mean something? And, how is it pronounced? I like those ice cubes you linked to! If only I hadn't just bought a ice cube tray for my mini fridge for my dorm. Those ice cube trays are hysterical! :)Love it! I love little gifts like this that really take thought and put a smile on a person's face. Love the iceberg ice-cubes, awesome! I love finding a store with quirky, fun, yet practical gifts (like the birdhouses for the keys-amazingly clever!). The name of the store is also a very good play on words. You should have your boyfriend tell you about what used to take place at torget. I have fond memories. Thank you for the comment on my blog, you're so sweet. Indeed I wonder that all the time. These cute designs are awesome. We have some shops here that sell these kinds of products (they're of scandinavian design) and my mother is a huge fan of them! They're so quircky and cute! I really like the birdhouse key holder! The whistle is good in case you feel threatened and want attention from the authorities.